to put me into the pool when the water bubbles up. 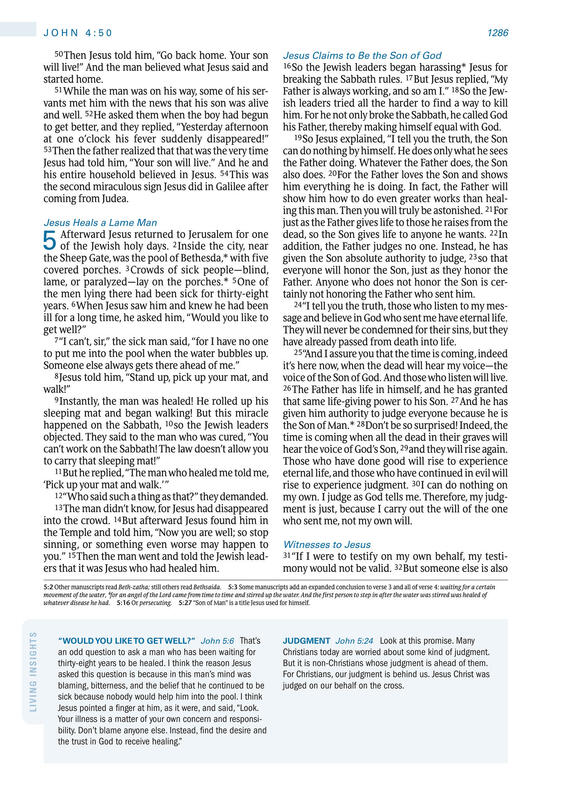 you.” 15 Then the man went and told the Jew­ish leaders that it was ­Jesus who had healed him. his Father, thereby making himself equal with God. Father. Anyone who does not honor the Son is certainly not honoring the Father who sent him. 24 “I tell you the truth, those who listen to my message and believe in God who sent me have eternal life. have already passed from death into life. voice of the Son of God. And those who listen will live. hear the voice of God’s Son, 29 and they will rise again. who sent me, not my own will. whatever disease he had. 5:16 Or persecuting. 5:27 “Son of Man” is a title Jesus used for himself. Jesus pointed a finger at him, as it were, and said, “Look. Christians today are worried about some kind of judgment. But it is ­non-­Christians whose judgment is ahead of them. judged on our behalf on the cross.